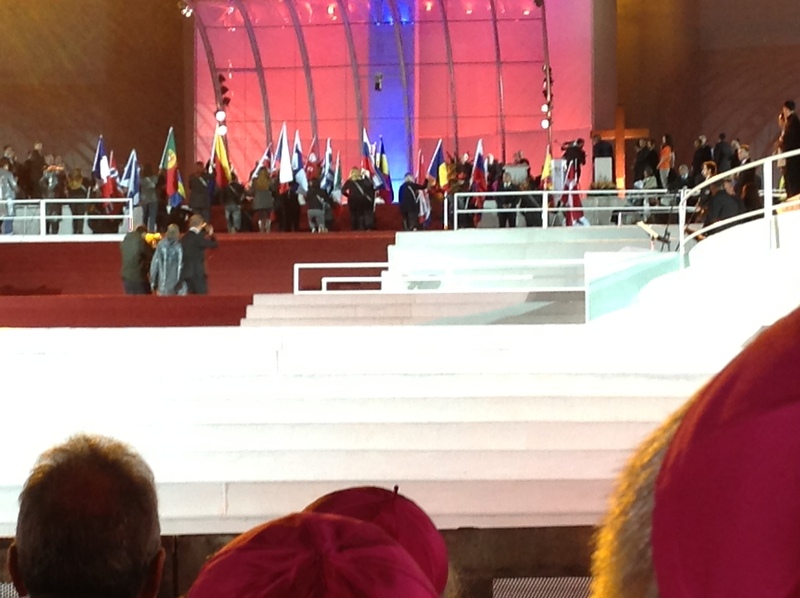 Last night we were at Copacabana Beach for the official arrival of Pope Francis to World Youth Day. The young people were “electric” (and I might add a few bishops as well). The pope spoke in Portuguese and Spanish strongly encouraging the youth to reject the false values of this world that will not bring happiness and to chose Jesus Christ as their all. There was an array of beautiful music and choreography depicting the history and diverse cultures of the Brazilian peoples. Much of the presentation centered on their great love and devotion of Mary. We finally all met as the group of pilgrims from the Diocese of Corpus Christi. 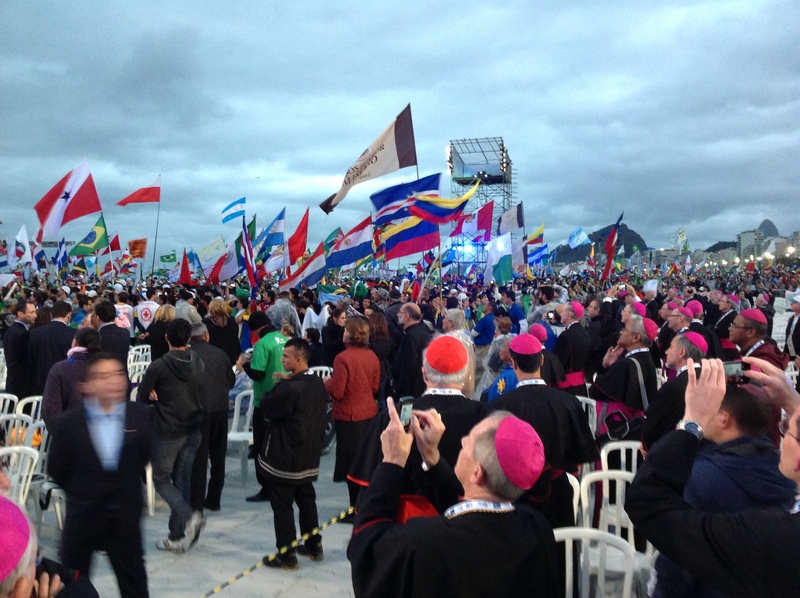 All arrived safely and all are very much alive in the spirit and theme of WYD 2013 – Hope, Discipleship and Mission/Evangelization. Cardinal Sean O’Malley, of Boston gave a very moving catechesis this morning on Witnessing to the faith as new evangelizers of the youth culture. The stronger his message became the louder the response from the young people. His talk must be on line on the World Youth Day website and other places. I would encourage you to listen…and don’t miss the question and answer period – brilliant. 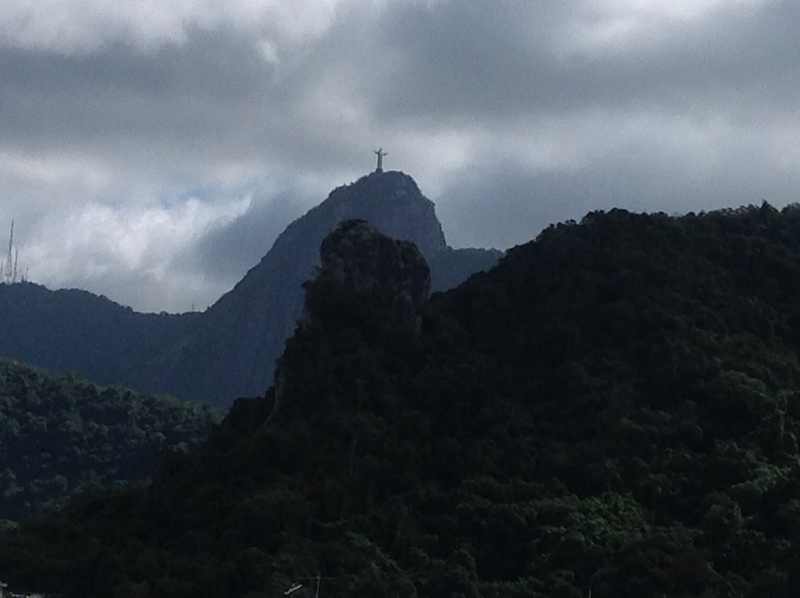 This afternoon, at 6 p.m. Pope Francis will lead the Stations of the Cross along Copacabana Beach. We have a wonderful view from the roof of the hotel; I’m reserving my seat there. The signals are a bit overloaded (1,000,000 cellphones, etc.) but I’ve attached are a couple of pictures. I’m dedicating these days of prayer for all the youth of your diocese – let’s witness to the beauty of our faith by letting all know that God loves us and completes our lives; He never takes anything away from us, He enriches us and gives us life. God bless you! Viva Cristo Rey!